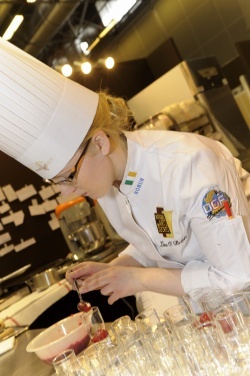 Lisa O'Brien, a student of BA in Culinary Arts, was awarded the "International Media Award" in the 3 day competition based on pastry and chocolate work which was held in Paris for her work on sugar, chocolate, petit fours and plated desserts. It was a huge achievement to be receive an award in this prestigious European competition. Lisa was supervised by Ms. Ann O'Connor and prepared for the competition under her training.